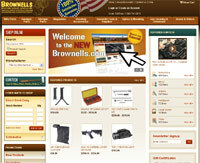 After considerable customer input and lots of work, the NEW brownells.com is up and running! This is the first major redesign in a number of years for this popular website with all the old tools customers appreciated and new features they’ve asked for. The search function is not only dramatically improved, it will adapt to the different methods customers use to find products and information. All products have been re-categorized into nine major areas, listed along the top of the home page. Product images can be enlarged with a simple click and many include the 360° photo feature for a really close look at all the details. Customers can also rate, review and comment on a product and get their questions answered through the interactive Answerbox feature. Checkout is now easier and faster as well. “I’ve been one of the biggest critics when it comes to finding a product on our site. Over the last month or so I’ve been working with the site’s test version and have been extremely impressed with just how darned well everything works,” said Frank Brownell, CEO. In addition to the all the great new features on the Shopping area of the site, the GunTech area has been centralized and reorganized as a featured section on brownells.com. The GunTech and Shopping areas are now more heavily linked to make the videos, articles, cheat sheets, instructions found under GunTech easily accessible from the product pages. Products are also accessible from the GunTech pages. Brownells is the world’s largest supplier of firearm parts, gunsmithing tools, equipment and accessories. Stocking more than 30,000 items, the company supplies armorers, gunsmiths, and shooters worldwide. All of their products are backed by a 100% satisfaction, unconditional, lifetime guarantee. To order, or for more information, call 800-741-0015 or visit brownells.com .